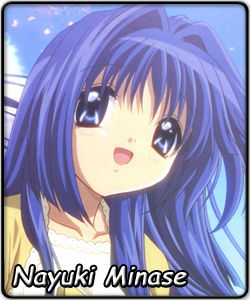 In the words of one Nayuki fanatic at Korean Saimoe 2007: "I like the Nayuki who is polite and proper to strangers. I like the Nayuki who is like a younger sister to Yuuichi. I like the Nayuki who is like an older sister to Ayu." She is a kind and helpful girl who (along with her mother) won't hesitate to help others even at some rather large inconvenience (letting someone live at your house with no advance warning - twice). She has a reserved personality for the most part, although this breaks into zombie mode when she encounters cute animals. She can suddenly get very energetic as she cuddles/molests Piro (a cat they found and adopt), in complete disregardence to her allergy to cats. She is infamously hard to wake up in the morning, despite her room full of loud alarm clocks, almost drowning herself once while trying to wash her face. The only surefire way of getting her to be fully alert in the morning is for Akiko-san (her mother) to bring out the jam. It is a food item so unholy that anyone who have tasted it before will politely run away as animal survival instincts kick in, even Jam lovers like Nayuki. Despite her sluggish morning routine, she is far from lazy - she's actually the captain of the track team and takes care of housework together with Akiko-san. Beneath the surface, Nayuki is emotionally dependent on family, which explains why she's so willing to let people live in her house with no advance notice.